Over the years, the web development scenario has completely changed. As the number of mobile users is growing, developers are switching from web development to mobile application. Today, there is a mobile application for almost everything. No matter if you are an iOS, Android or Window user, you can download a myriad of mobile applications on your phone for various purposes. If you're a WordPress owner and planning to build a mobile application to serve your mobile users, you are at the right place. In this post, we will learn how to create an iOS/Android mobile app for WordPress. But before that, we would like to throw some light on the importance of having a native mobile application. As said before, mobile users are growing day by day, it is necessary to have a mobile application for your business. In the current scenario, when everyone is having smartphones, tablets or iPhones, it can be quite hazardous to stick to just desktop websites. Though responsive and adaptive sites offer various features of mobile applications yet they are not enough capable to offer your audience the whole experience of your desktop site. Most responsive websites do not include various advanced features which you get with mobile applications such as offline browsing, push notifications, content update, etc. Besides this, mobile applications are easier than responsive websites to access in a single tap. Like responsive sites, mobile applications don't require users to type website URL in the browsers of their phone. That is why most people prefer to use the Facebook mobile application rather than Facebook mobile version. No matter whether you are running your site on WordPress.com or Wordpress.org, building an app is the best way to bring brand awareness, make better customer engagement and boost business. If you're interested in knowing the difference between WordPress.org and WordPress.com, you must read this amazing post on 000webhost.com. Building mobile application for a WP site makes sense in the following situations. If you want to offer native functionalities to mobile users such as a call to action, Geo-location, etc. If you have an eCommerce website, it will be better for you to build an online mobile application for your site. The mobile application is a better choice if you are in the business of online interactive games. You should think about creating a mobile application if you want to give your users a platform that can be accessed without an internet connection. If you think your mobile application will be used on a regular basis. There are plenty of options available when it comes to transforming a WP site into a native mobile application. Let's have a look at them and know how capable they are to build a fully-functioning mobile application. Mobiloud is a popular application builder that helps you convert native mobile application for WordPress site. This mobile application builder lets you design, preview and publish a mobile application in few simple steps. It comes with features like advertising & analytic solutions, push notifications, etc. It is another user-friendly application building tool that you can use to build a mobile application for a WordPress website. Even if you're not expert in web coding, you can easily transform your site into Android/iPhone application within few minutes. With this tool, you just need to focus on the user experience of your application rest the things will be taken care of by IdeaPress itself. Though these plugins are popular and have been used by millions of people across the globe yet they are not enough capable of providing the attractive results. Actually, these plugins just render website's homepage as an application on mobile devices. And when users tap on the application icon, these plugins simply offer them the mobile version of websites, not the application version. They offer an experience similar to what you get when you access a mobile version of a desktop site into your mobile. You must optimize your WP site on a mobile device before going with above-mentioned application building solutions. These solutions are good options for mobile-optimized sites. To optimize your site for mobile devices, you may use the following tools such as iThemes Mobile, WPtouch, etc. Now the question is how to create a mobile application for a WordPress site if it is not mobile optimized. And the answer is AppPresser. For those who don't know, AppPresser is a popular mobile application builder or framework, which is specialized in WordPress integration. It supports various extensions and theme using which you can create a professional iOS/Android application for a WordPress site quite easily. Unlike above-mentioned tools and applications, it comes with various advanced features such as Geolocation integration, camera integration, contacts, integration etc. Besides this, AppPresser also supports various extensions such as AppCamera, AppTheme, App Push, AppSwiper, AppWoo, etc. You can use them to enhance the functionality and appearance of your site. Before buying AppPresser, we would suggest you get some brief information on its functionality and features. You can use AppPresser Developer Handbook for that. The very first thing that you need to do is installing and activating the AppPresser plugin. There are two ways to do it. You can either download the plug-in from the official WordPress.org repository or you can manually search for 'AppPresser' in your WP dashboard under the 'Plugins' option. Choose any method that you feel better. Your next step will be installing the AppTheme (theme of AppPresser) for your app site. Don't worry, it will not affect the actual (default) theme of your website. 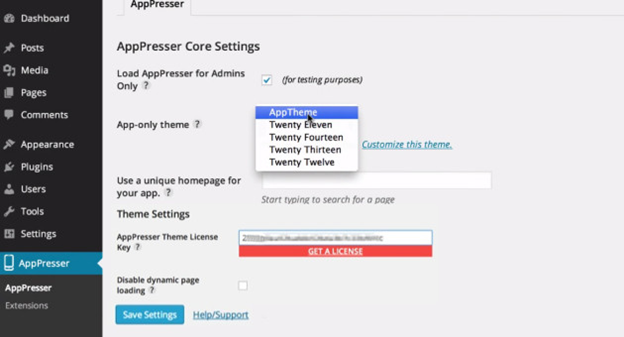 To install the AppTheme you will have to create an account on AppPresser. Once you have created the account. Next, you have to sign into your account. Here you have to, Go to My Account -> View Details and hit 'Download' button. Note: Save your license keys and other details for future use. Next, access your WP dashboard again. Go to Appearance under the Themes option. Here you will find an option to upload a file. Upload the downloaded file (AppPresser theme file). Note: Don't choose the Install Now button available on this page. Now you will be able to see 'AppPresser' menu in your WP dashboard, most probably underneath the 'Settings' menu. Click on it, and it will take you to the AppPresser Core Settings screen. You have to do the followings on this setting page. Check the box in front of option "Load AppPresser for Admins Only". It will help you to preview your app as admin. Set 'AppTheme' in 'App-only theme' option. Type in the name or Id of the page which you want to use as a home page for your application. Next, enter the AppPresser Theme License Key, which you have saved earlier. It is as simple as that! Now you're ready to customize the appearance and functionality of your mobile application according to your requirements. To give your app a unique appearance, you may use the various customization options offered by AppPresser. Once you are done with all the customization of your mobile application, it is time to get it listed in App stores. Let's find out how to do that. Google Play Store & iTunes Stores are the two popular application stores where you would like to list your mobile application. To sell your mobile app on these platforms, you will have to buy their developer license. AppCamera - You can use this extension to build a professional photo sharing application for both Android and iOS users. Geolocation - It is another important extension which lets you recognize your current location. AppWoo-It can be used to develop an eCommerce application. AppBuddy - Using this tool, you can convert your BuddyPress websites into a social networking application. AppPush - You may use it send push notifications to your app users. 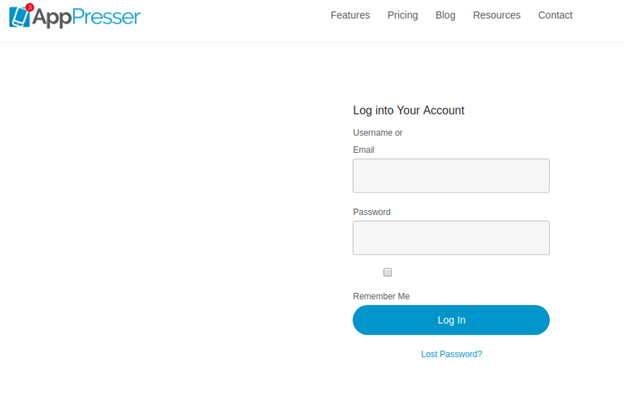 Wrapping Up: AppPresser seems a good option to build a native iOS/Android mobile app for WordPress. We hope AppPresser will help engage with your mobile users and boost revenue.